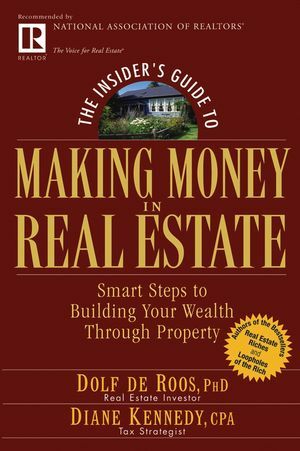 The Insider's Guide to Making Money in Real Estate explains why real estate is a consistently profitable moneymaker and how everyday people just like you can build their fortune regardless of their credit score or how much money they have in the bank. It's true--you don't have to be rich to invest in real estate. It's the easiest, most leveraged method for building sustainable wealth over time, and it's open to everyone. DOLF de ROOS, PhD, is a successful international real estate investor, and a New York Times and Wall Street Journal bestselling author. He sometimes shares his strategies and thinking at seminars across the nation and throughout Australia, New Zealand, Asia, and Europe. He is Chairman of the public real estate investment company Property Ventures Limited, and also the author of Real Estate Riches and coauthor (with Diane Kennedy) of The Insider's Guide to Real Estate Investing Loopholes, both from Wiley. DIANE KENNEDY, CPA, is a top real estate author and investing expert. She is the founder and owner of DKA, a leading tax strategy and accounting firm. She is also the author of Loopholes of the Rich and The Insider's Guide to Real Estate Investing Loopholes, both from Wiley. PART ONE: Fundamentals of Real Estate. CHAPTER 1: Real Valid Reasons Why You Can’t Make Money in Real Estate. CHAPTER 2: Why Real Estate? CHAPTER 3: What It Really Takes to Succeed in Real Estate. CHAPTER 4: The Five Fundamental Wealth-Building Strategies of Real Estate. CHAPTER 5: What Type of Investor Are You? PART TWO: Getting Ready for Real Estate. CHAPTER 6: Categories of Real Estate. CHAPTER 7: Finding Hidden Money. CHAPTER 8: Creative Sources of Funding. CHAPTER 9: Understanding the Numbers. CHAPTER 11: Cycle of a Property. PART THREE: Secrets of Success through Teams. CHAPTER 12: Designing Your Team. CHAPTER 13: Interviewing Team Members. CHAPTER 14: Building a Team That Works. Appendix B: Short Version of This Book.